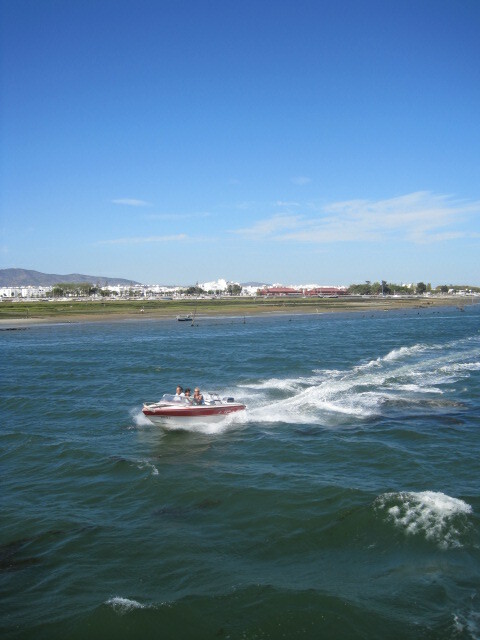 Shall we start with a ferry ride? 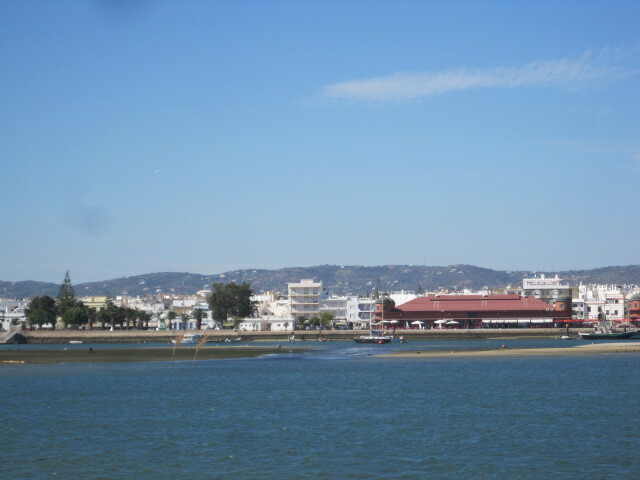 This week’s walk is on the island of Culatra, so you’ll have the added bonus of a ferry ride- always irresistible to me. But for those of you who are poor sailors, let me assure you of gentle, calm waters. 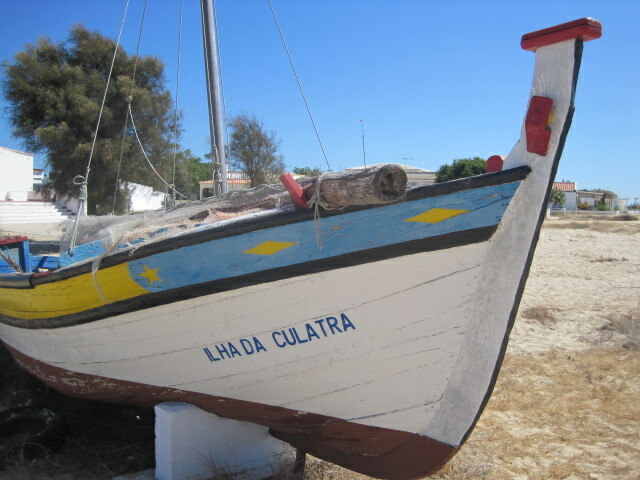 I referred briefly to Culatra in my I is for Ilhas (islands) post and I thought it might be time to take a closer look. I think you might like it. 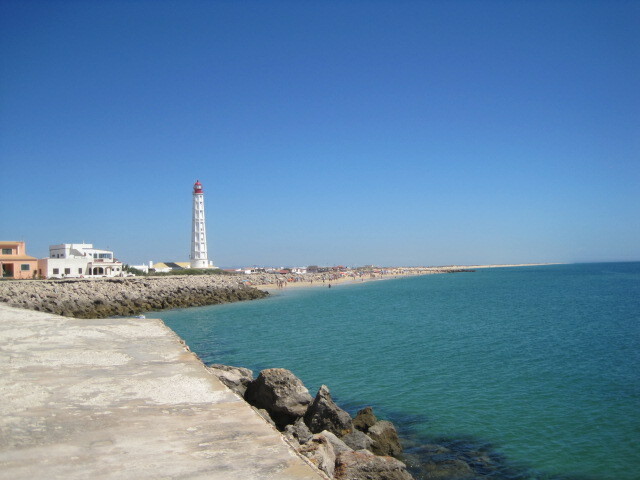 Departure points for the ilha are from the city of Faro, the Algarve’s capital, or from the nearby fishing town, Olhão. It’s a short 30 minute sailing from the latter. The ferries depart at 9.00, 11.00, 15.00 and 17.00, so what are we waiting for? Don’t forget your sunscreen, and flip-flops will be just fine for this trip. Is this water flat enough for you? There’s always someone who likes a little fun! Here we are, at the first port of call already! The ferry docks first at the eastern end of the island, with a busy little marina, the church and a couple of restaurants. 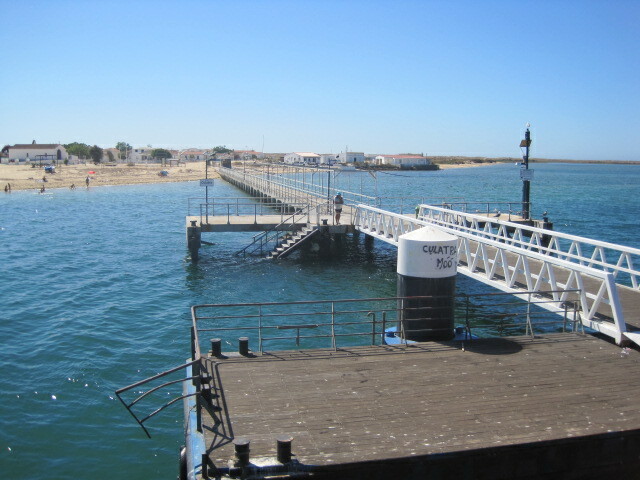 If you like you can get off here and walk along to Farol, but I like to stay on till the second stop, 10 minutes later. As the ferry chugs alongside the island, the lighthouse for which the settlement is named looms larger. 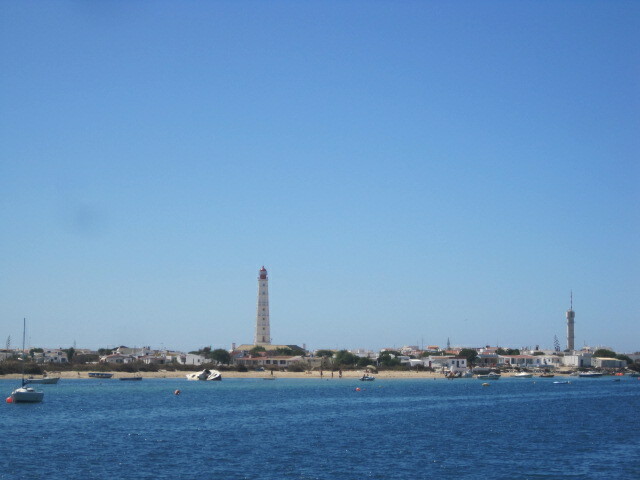 Often your flight path into the Algarve will carry you over the islands and you have an aerial view of Farol. Ok, so you’ve indulged me the watery stuff. Thank you! Now it’s time to stroll a little. You’ve probably guessed what we’ll be going to see, haven’t you? But eventually you come face to face! 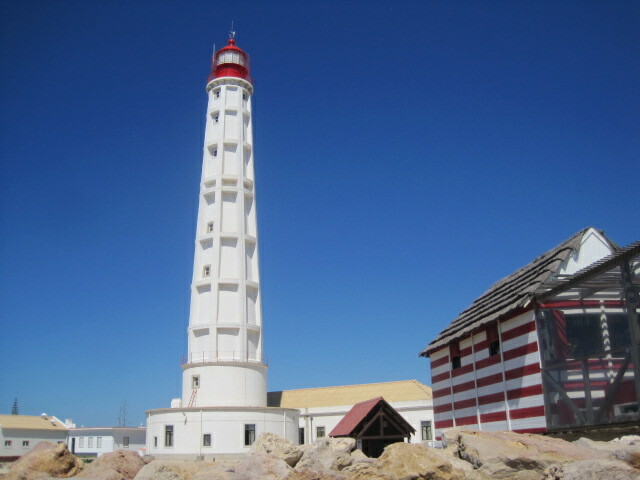 The lighthouse is situated on a rocky headland, above a small beach, crowded with locals on a weekend. Continue past that and you have seemingly endless sand. Off with those flip-flops and away you paddle! I think that’s a wreck out at sea? After a while you will see a sign board pointing inland and a boardwalk. This is your cue to put the flip-flops back on and follow it, over some low dunes. 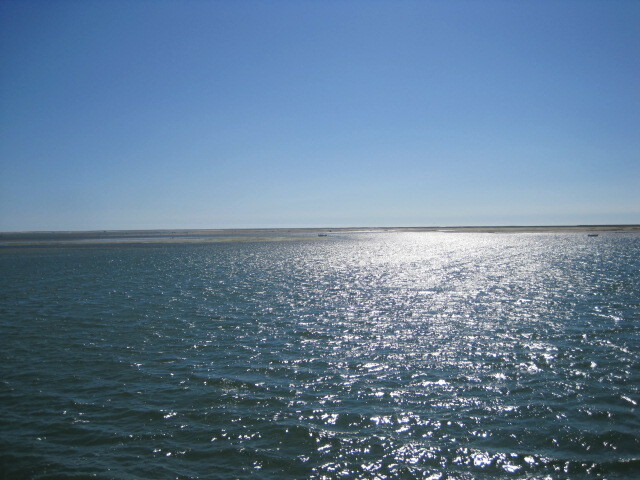 You will see the first port where the ferry docked ahead in the distance. Arguably the best bit of the walk starts now. 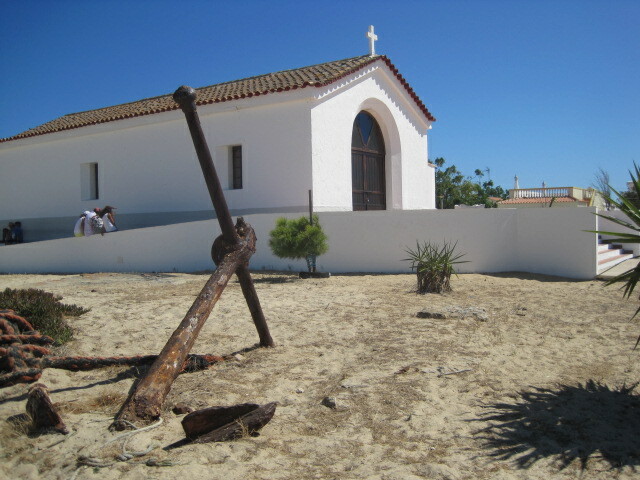 As you approach the village the path becomes lined with an array of beach houses and their gardens. All shapes and colours are represented- some tasteful, others… well, let’s say interesting. Now you’re back at the marina, with its host of little fishing vessels. There are several small bars and restaurants where you can blend in with the locals while you await your return ferry. 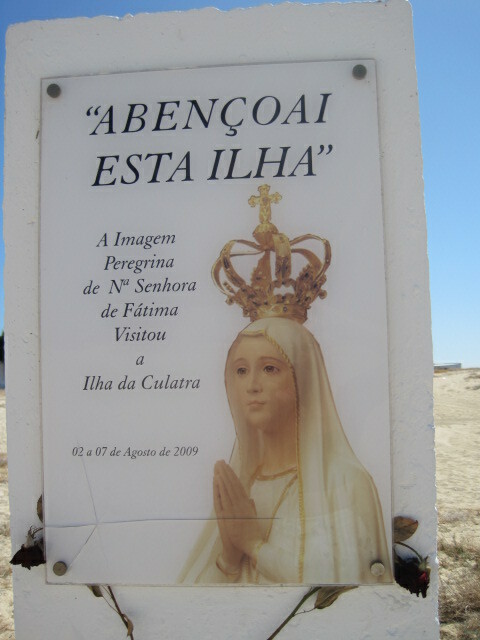 The ticket office only opens 10 minutes before the boat is due, but you might well have bought a return- ide e volta. 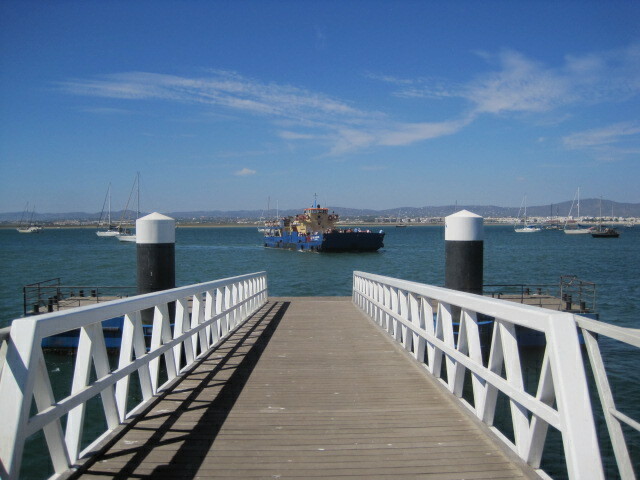 The ferry will stop again at Farol so you can do this walk in either direction, or both ways if you’re keen! Many thanks for your time and your company. Will you join me next week on a Monday walk? The details are on my walks page or just click on the logo below. Now for the good stuff! Time to put the kettle on and read my ‘shares’. Thanks again to all my contributors. Have a happy week! Thanks a lot, Cynthia 🙂 Sorry, I must have missed this on my travels. How are you? Beautiful! I have only been to northern Portugal and loved it. Thanks Jo. Don’t expect too much..My lenses are very basic. Wanted to upgrade, but decided my usage didn’t justify the cost quite yet. My kind of walk. Relaxing, close to the waters, lots of warm sunshine. The “flat water” photo was my fav – cos it also had the glisten and feel of the vast and open sea – but really who can pick a favorite photo from any of your walks??? – so forget that I said it was my fav – I like them all. and the collage with the flowers and rooftop shots all fit in with the diff beach angles. and what a unique lighthouse – I like the geometric grid design they gave it. Thanks, Peter. You’re very kind 🙂 I have great material to work with.